Air pollution joins the privileged coronary league ! Diabetes , smoking , hypertension , dyslipidemia are the leading cause of cardiac morbidity and mortality . Now air pollution the( passive atmospheric smoking !) is threatening to be a major risk factor . In fact , it has become the official cardiac risk factor nominated by WHO ! 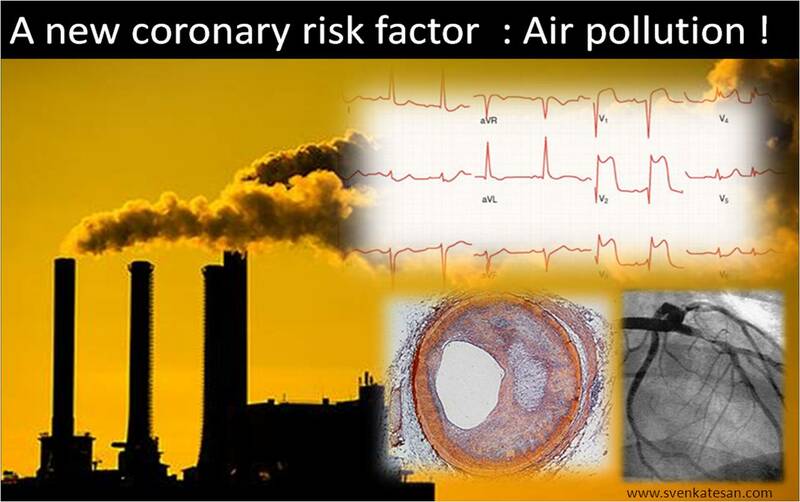 40 % of all deaths due to air pollution is due to cardiac events . The surprise element is indoor air pollution is equally injurious . The WHO assessment found the majority of air pollution deaths were linked with cardiovascular diseases. Coronary artery disease can be termed as “New age plague” afflicting the mankind ! It probably has killed ( or Killing ) as many lives as most other diseases put together. Why only a section of our population is vulnerable is not fully understood . We are familiar with coronary risk factors for too long . . . still . . .
We do not understand why 50% CAD occur in people who have no known coronary risk factor ! There has been propositions and dispositions of various risk factors . The latest one is the Air pollution. This is quiet interesting, as air is the staple food of human survival . We eat , drink , (Rather inhale ) about 500 ml /of air every 3 to 4 seconds for 24 hours a day for 365 days , for our life time ! Does the air we breath reach the largest cardiovascular organ namely the vascular endothelium ? Yes definitely , not only it reaches the endothelium but also injures it (When it contains gases other than oxygen ) .While tobacco is a well established endothelium destroyer , it is no surprise community smoking ( Air pollution !) will do the same job with perfection . What are the proposed toxins in the air pollution that harm the endothelium ? It is a mixed masala gas out there over our polluted cities ! . (Atmosphere, Industrial, Automative ,Domestic, Human , and other invisible sources ) We need to analyse further to answer this question authentically . Though , common sense is enough to establish the link between air pollution and CAD. We have lots of evidence coming up . . .
We will be shortly reporting our experience with endothelial function assessment in traffic police population of our city Chennai ,India .